Cosimo was born in Florence, on June 12, 1519, the son of the famous condottieri Giovanni dalle Bande Nere from Forlì and Maria Salviati. Cosimo came to power at 17, when the 26-year-old Duke, Alessandro de' Medici, was assassinated in 1537, as Alessandro's only male child was illegitimate. Cosimo was from a different branch of the family, and so far had lived in Mugello, and was almost unknown in Florence: however, many of the influential men in the city favored him, several of them hoping to rule through him and thereby enrich themselves at the state's expense. However, as Benedetto Varchi famously put it "The innkeeper's reckoning was different from the glutton's." Cosimo proved strong-willed, astute and ambitious, and soon rejected the clause he had signed, which entrusted much of the power to a council of Forty-Eight. Toward the end of July 1537, the exiles marched into Tuscany under the leadership of Bernardo Salviati and Piero Strozzi. When Cosimo heard of their approach, he sent his best troops under Alessandro Vitelli to engage the enemy, which they did at Montemurlo, a fortress that belonged to the Nerli. After defeating the exiles' army, Vitelli stormed the fortress, where Strozzi and a few of his companions had retreated to safety. It fell after only a few hours, and Cosimo celebrated his first victory. The prominent prisoners were subsequently beheaded on the Piazza or in the Bargello. Filippo Strozzi's body was found with a bloody sword next to it and a note quoting Virgil, but many believe that his suicide was faked. In June 1537 Cosimo was recognized as head of the Florentine state by the Holy Roman Emperor Charles V, in exchange for help against France in the course of the Italian Wars. With this move he firmly restored the power of the Medici, who thereafter ruled Florence until the death of the last of the Medici, Gian Gastone de' Medici, in 1737. The help granted to Charles V allowed him to free Tuscany from the Imperial garrisons, and to increase as much as possible its independence from the overwhelming Spanish influence in Italy. Cosimo next turned on Siena. With the support of the Emperor, he defeated the Sienese at the Battle of Marciano (1554), and laid siege to Siena. Despite the inhabitants' desperate resistance, on April 17, 1555, after a 15-month siege, the city fell, its population diminished from forty thousand to eight thousand. In 1559 Montalcino, the last redoubt of Sienese independence, was annexed to Cosimo's territories. In 1569, Pope Pius V elevated him to the rank of Grand Duke of Tuscany. 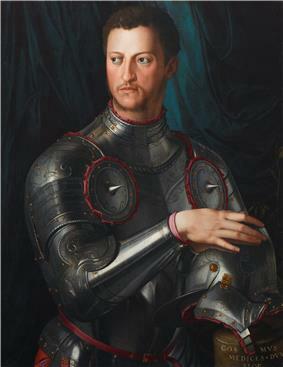 In the last 10 years of his reign, struck by the death of two of his sons by malaria, Cosimo gave up the active rule to his son and successor Francesco I de' Medici, Grand Duke of Tuscany. He retreated to live in his villa, Villa di Castello, outside Florence. Cosimo was an authoritarian ruler and secured his position by employing a guard of Swiss mercenaries. In 1548 he managed to have his relative Lorenzino, the last Medici claimant to Florence, assassinated in Venice. Cosimo also was an active builder of military structures, in an attempt to save his state from the frequent passage of foreign armies (examples are the new fortresses of Siena, Arezzo, Sansepolcro, the new walls of Pisa and Fivizzano, and the strongholds of Portoferraio, on the island of Elba, and Terra del Sole). He laid heavy tax burdens on his subjects. Despite his economic difficulties, he was a lavish patron of the arts and also developed the Florentine navy, which eventually took part in the Battle of Lepanto, and which he entrusted to his new creation, the military Order of St. Stephen. Cosimo is perhaps best known today for the creation of the Uffizi ("offices"). Originally intended as a means of consolidating his administrative control of the various committees, agencies, and guilds established in Florence's Republican past, it now houses one of the world's most important collections of art, much of it commissioned and/or owned by various Medici. His gardens at Villa di Castello, designed by Niccolo Tribolo when Cosimo was only seventeen years old, were designed to announce a new golden age for Florence, and to express the magnificence and virtues of the Medici. They were decorated with fountains, a labyrinth, a grotto and ingenious "water jokes," and were a prototype for the Italian Renaissance garden. They had a profound influence on later Italian and French gardens through the eighteenth century. He also finished the Pitti Palace as a home for the Medici and created the magnificent Boboli Gardens behind the Pitti. As his more prominent ancestors had been, he was also an important patron of the arts, supporting, among others, Vasari, Cellini, Pontormo, Bronzino, the architect Lanci, and the historians Scipione Ammirato and Benedetto Varchi. Cosimo was also an enthusiast of alchemy, a passion he had inherited from his grandmother Caterina Sforza. 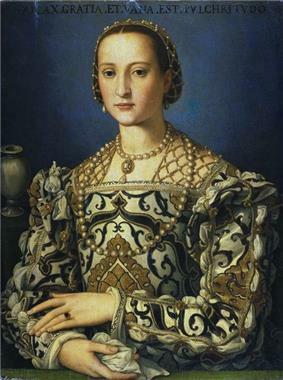 Eleonora of Toledo, Duchess of Florence, who purchased the Palazzo Pitti in 1549 for the Medici family. In 1539, he married Eleonora di Toledo (1522 – 1562), the daughter of Don Pedro Álvarez de Toledo, the Spanish viceroy of Naples. Her face is still familiar to many because of her solemn and distant portraits by Agnolo Bronzino. The most famous of them, with her son Giovanni, hangs in the Uffizi Gallery. She provided the Medici with the Pitti Palace and seven sons to ensure male succession and four daughters to connect the Medici with noble and ruling houses in Italy. 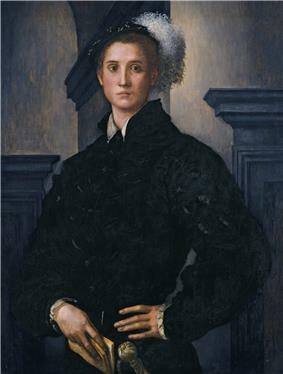 She was a patron of the new Jesuit order, and her private chapel in the Palazzo Vecchio was decorated by Bronzino, who had originally arrived in Florence to provide festive decor for her wedding. She died, with her sons Giovanni and Garzia, in 1562, when she was only forty; all three of them were struck down by malaria while traveling to Pisa.